Recently I was lucky enough to be invited to go to the Paul Smith Spring Summer ’18 Show in Paris and today I thought I would share everything about it with you. The show itself was bright, fun and gave off all the summer vibes. On arrival we were greeted with biscuits and ice-cream, something we were very grateful for in the scorching Paris heat. Alongside the rubber fish invitation I had received a few weeks prior to the show, these little touches gave a small taste of what we were in for once we got inside. Summer was about to begin. Once inside there was a buzz of excitement in the air as the lilac carpeted atrium gradually filled up and everyone settled into their seats. We were standing and got into a great position at the end of the catwalk, right next to all the press. Whilst waiting for the show to start I did some great people watching, I mean what better place could there be to do that than Paris Fashion Week! It was really interesting to see what everyone was wearing and there was a huge variety of styles, even just along the front row. Inspiration central! Incase you haven’t already twigged from the pictures, the show was a combined mens and womens show, something that seems to have been becoming more popular in recent years. Sometimes when designers make this decision it can look clunky, but that definitely wasn’t the case here. The show flowed seamlessly and it felt really natural having both genders walking together. A great call from the team at Paul Smith. Now onto my favourite part, of course, the clothes. From magenta to grey and emerald to orange there seemed to be colours from every end of the spectrum, this being reflected by the striped screen backdrop. 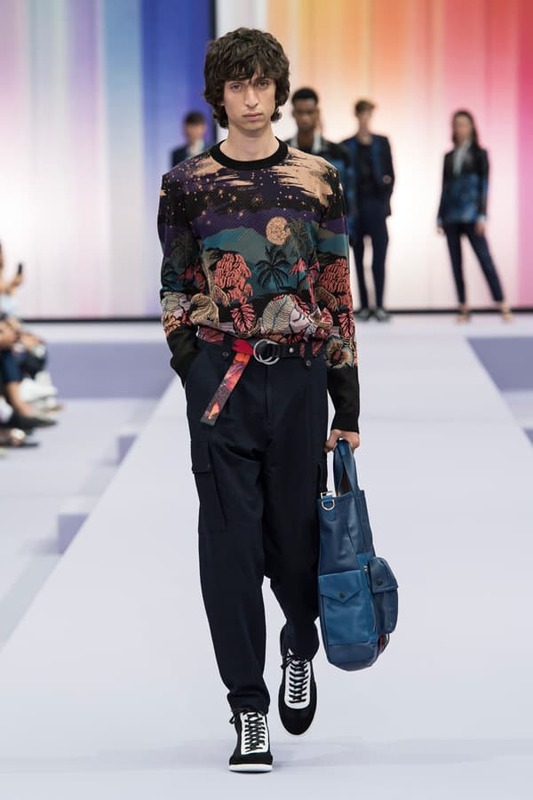 The models flowed onto the catwalk in waves of punchy brights and soft pastels punctuated by aquatic, Hawaiian and floral motifs and Paul Smith‘s playful side was brought in with a fish packaging pattern taken from Japan, which dominated the accessories. It was cohesive, it was fun and there was something nostalgic about the styling of the clothes. My personal favourites were the nighttime Hawaiian scene printed jumpers, I just loved how well the pattern and colours worked with the classic Paul Smith tailoring. Overall it was a brilliant show that was topped off by a trip backstage and a handshake from the man himself, Paul Smith. What a day. Click here to watch the full show on Paul Smith‘s Youtube Channel and visit Paul Smith’s Website here.